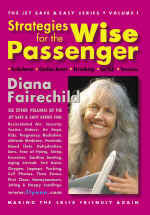 Strategies for the Wise Passenger is based on Fairechild s in-depth research and vast correspondence with readers of her previous aviation books and her website.Written to inform and empower airline passengers and crew, Fairechild s writing takes us on an exciting journey packed with critical information and useful safety tips on the realities of air travel. Though we may embark feeling uneasy, by the time we land at the end of each chapter, we feel reassured because we know what we need to do to take care of ourselves -- and we ve had a few laughs along the way.・14 ways to prevent injuries during severe turbulence. ・What to do if you suffer cardiac arrest on board ・13 ways to recognize and defeat a terrorist.・14 tips for those over 6-feet tall.・The Passenger Bill of Rights.・And much more. . .